Hi, and welcome to my online diary on the construction of an upscaled Quest Intruder, I've named "The SkyPirate". This was my first custom project and things didn't always go as quickly or easily as planned. Experienced High Powered Rocketeers probably won't find anything new or miraculous here. Newbies and rocketeers embarking on their first custom project may learn from my experience. One word of warning, this page will be under heavy construction. History may periodically be revised to improve accuracy or to give credit where credit is due. Aerotech, the major supplier of high powered rocket motors, factory burns to the ground. This left just about everyone wondering what would happen to the hobby. Almost every source of existing motors was quickly exhausted. I thought it might be a good idea to focus on some small scale projects and picked up a Quest Intruder from the local MJDesigns. I fell in love with the design, but I just felt like it needed to be bigger. So I upscaled it to a BT-56 bodytube and a D motor mount (I also downscaled it to a BT-20). Well, the BT-56 upscale fueled the fires of inspiration and the desire to build some absurd scale version of the Intruder was born. My initial focus was on a 4 inch upscale, but I didn't think the wingspan would fit in the back of my car and I figured the fins would cost too much. I considered 3, 2.6 and 2 inch diameter versions and decided on the 3 inch. Meanwhile, I'd never actually flown any of my other Intruders and I'd read some reviews citing unpredictable stability. I posted a thread on RMR asking if anyone had done an upscaled Quest Intruder. No responses, but my SPAM increased significantly. At the heart of the Intruder, is an exotic fin design. The position and alignment of the six fins was just as unusual, not conforming to a traditional hexagonal layout. For years, I'd seen several companies advertise that they offered custom G10 fin cutting services, but none them seemed at all enthusiastic about taking on this project. Jim Turner, owner of Trailing Edge Technologies, had never cut G10, but volunteered to try. I had heard a lot of stories about G10 ruining blades, machinery and health and I valued his friendship too much to accept his offer until I did a little more research. Is a Confederate Flag the answer? Well, no. But that was my first thought when Google provided a link to a Rebel Rocketry. As the Rebel Rocketry site came up, I realized this company wasn't in America. Vivid, stunning European landscapes with rockets in the foreground painted up on the screen. 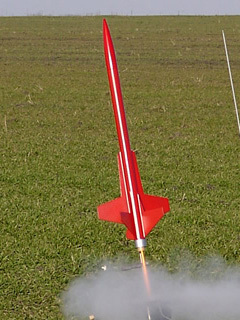 Rebel Rocketry ended up being based in the Netherlands. Frank DeBrouwer, the owner, was enthusiastic and the price was right. One minor issue would be the metric widths of the G10 fin stock. One major hurdle overcome. An all Dutch Project? There was something kind of cool about an "International" project and a trivial triple coincidence. My Dutch heritage, Jacob Vandergriff was captain of the Dutch trading ship Swol that settled in America in the 1600's. 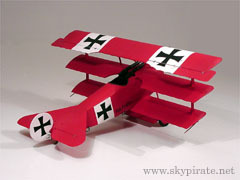 Add a Dutch rocket company and paint scheme based on the Red Baron's Fokker Triplane (while the Red Baron was German, airplane designer Anthony Fokker was Dutch). Photo courtesy of Bill Gee. I finally flew the 1.346" diameter Intruder on an Estes D12-5. A very stable and rather dramatic looking flight. However, the red paint looked a little toyish. So the larger version would definitely have an all metallic finish. That's no optical illusion, the wingspan of the upscaled Intruder is greater than the length of the original model. The fins were clean and remarkably precise. Frank had done an excellent job. I had spent a lot time in front of the computer screen designing it and setting yard sticks out trying to visualize it. But having the fins in hand, brought the dream one step closer to reality. 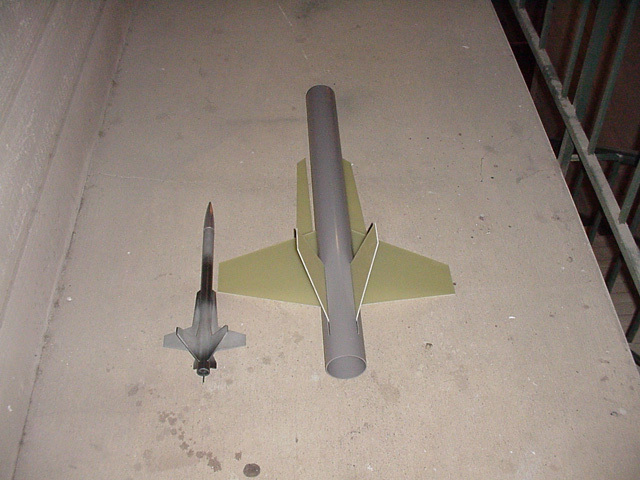 I put together orders for both Public Missiles and Giant Leap Rocketry for the other parts. After six weeks of searching, I found a great artist to create the female mascot for "The SkyPirate". Gary Ham seemed intrigued by the project and agreed to take it on. High power rockets can reach very high altitudes in a short amount of time. The resulting decrease in air pressure at these altitudes can actually cause a nose cone to pop off earlier than expected. The results are not pretty. 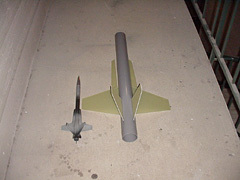 A pair of 1/8 inch vent holes were drilled in both the payload and booster sections of the rocket. The majority of the rocket's individual pieces had arrived and it was time for a group photo. 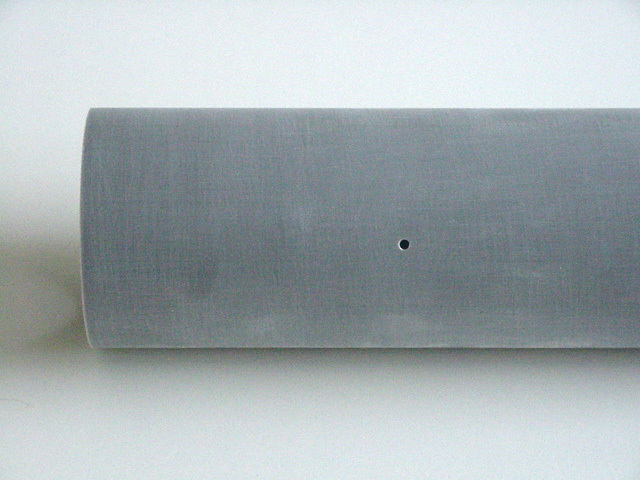 Motor mount, centering rings and phenolic motor tube. Booster airframe, PML Quantum Tube. 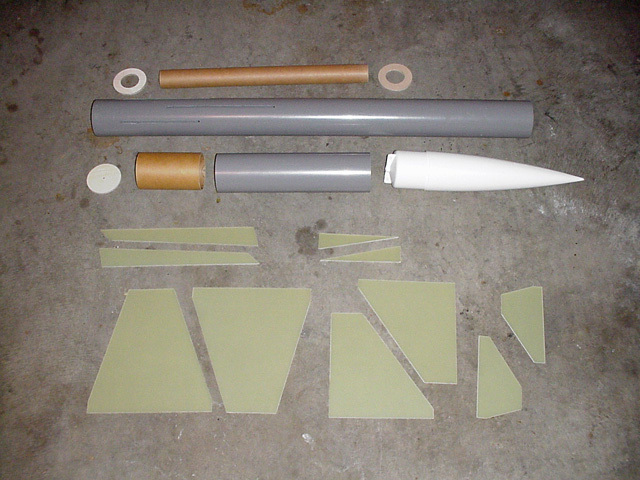 Payload section and nose cone. Fins made of 2mm G10 fiber glass. 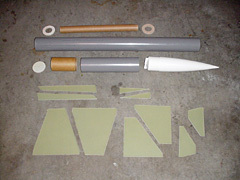 The goal of sanding the fiberglass fins is to provide a surface area that epoxy and paint can hold on to. With the Intruder, there was more surface area and pieces than any rocket I had previously built. I went to Home Depot to pick up a couple of grades of sandpaper for my power sander. They had sold out of the coarse grade, so I settled for 100 grit. I also picked up some breathing masks and goggles. Fiberglass dust is not something you want in your eyes or lungs. I also wear latex gloves while sanding. An hour and a half later, the flat areas of the fins were sanded, beveling the fins could wait a day. Later that evening while watching TV, I sanded the outer surfaces of the PML Quantum tube using a 3M foam sanding pad. Using the hand held power sander just wasn't going to produce anywhere near even bevels. My solution was to use an aluminum right angle and 80 grit adhesive sandpaper strips. Folding 80 grit sand paper didn't create a very crisp corner, so I resorted to butting two strips up to the corner. This worked much better. 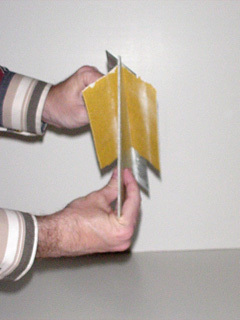 Both sides of the fin get sanded simultaneously and evenly. About an hour and half for the ten pieces. To enhance the surface area the epoxy will wick into, I scored the tang at forty-five degree angles to the root edge. Then I drilled 1/8 inch divots half way into the tang, spaced about an inch apart.